131, Kn. Maria Louisa Blvd, 1202 Sofia, Bulgaria. Dedeman hotel Princess Sofia, built in 1977 and refurbished in 2002, has 16 floors buildings and a total of 97 single rooms, 467 doubles, 2 suites and 7 apartaments. The hotel offers hair dresser, bar, pub, restaurant and internet connection. You can park your car in the parking or in the garage. Room service and laundry are also available. 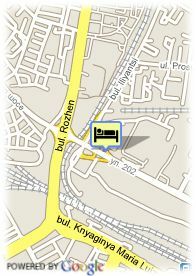 The hotel is located in the centre of town, close to the train station. In the surroundings you can find bars, restaurants and shops. A public transport is just 100 meters away. All rooms have bathroom, hair dryer, telephone. internet connection, minibar and fridge. Children less than 12 years and more than 2 year(s) old: 10.00 € for each additional bed.